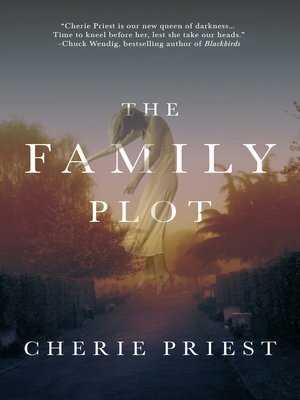 From Cherie Priest, author of the enormously successful Boneshaker, The Family Plot is a haunted house story for the ages—atmospheric, scary, and strange, with a modern gothic sensibility that's every bit as fresh as it is frightening. Music City Salvage is owned and operated by Chuck Dutton: master stripper of doomed historic properties and expert seller of all things old and crusty. Business is lean and times are tight, so he's thrilled when the aged and esteemed Augusta Withrow appears in his office. She has a massive family estate to unload—lock, stock, and barrel. For a check and a handshake, it's all his. It's a big check. It's a firm handshake. And it's enough of a gold mine that he assigns his daughter Dahlia to personally oversee the project. Dahlia and a small crew caravan down to Chattanooga, Tennessee, where the ancient Withrow house is waiting—and so is a barn, a carriage house, and a small, overgrown cemetery that Augusta Withrow left out of the paperwork. Augusta Withrow left out a lot of things. The property is in unusually great shape for a condemned building. It's empty, but Dahlia and the crew quickly learn it is far from abandoned. There is still something in the Withrow mansion, something angry and lost, and this is its last chance to raise hell before the house is gone forever.